Since 2001, our economy has become weaker and taxpayers' money has been wasted. The ULP regime has squandered over $4 billion dollars. We will never create prosperity for our people if we continue to beg from other countries like Gonsalves does. Gonsalves is not a university graduate in finance. He has clearly shown that when it comes to finance and economics, he is feeling his way in the dark and getting it wrong with his economic incompetence. This has caused high unemployment, forced many businesses to close down and created a massive public debt. SVG's economy is on the verge of collapse. SVG must go Green. We need a new engine for our economy that is fit for the 21st century. We have to become a country that produces ideas and innovation that can solve problems facing people the world over. It has been said that the rich countries of the future will be the ones that innovate most. SVG needs to develop a sustainable economy comprised of greener industries and enterprises. Great steps in innovation, investment, education and science and technology are necessary to rebuild the SVG economy. The greening of industries and enterprises will provide stability and create thousands of new jobs. In 2013, the United Kingdom's entire renewables sector already employed 250,000 people and was worth £33bn a year to the UK economy. 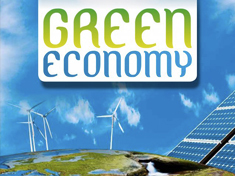 The global Green market is projected to reach £4 trillion by 2015 as economies around the world invest in Green technologies. A Green government will help SVG small businesses get a slice of this big Green pie. A strong green economy will provide long-term, jobs and give our people prosperity.